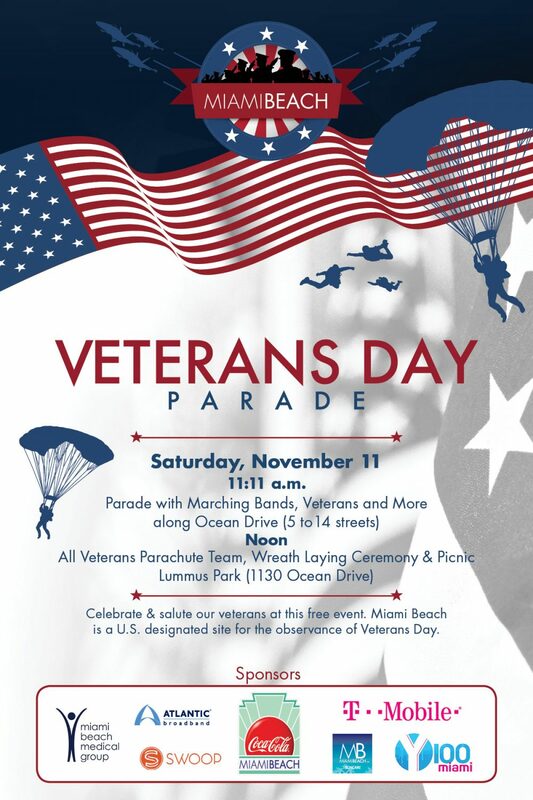 In celebration of Veterans Day, Miami Beach will hold the annual parade along Ocean Drive from 5 Street to 14 Street. 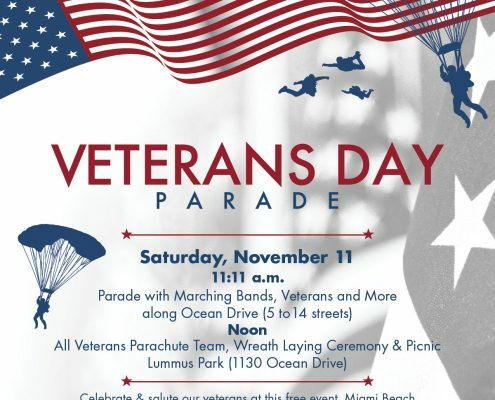 The parade is followed by a ceremony and picnic with a demonstration from the All-Veterans Parachute Team on Ocean Drive. There will be exciting floats, veteran and military groups, school marching bands, cars, and a high-flying all veterans parachute team that will come in for a landing on Ocean Drive for a wreath laying ceremony and picnic. The U.S. Department of Veterans Affairs has proclaimed the Miami Beach event as the official regional site for the observance of Veterans Day. World War II Army Air Corp veterans played a major role in the history and development of Miami Beach. Miami Beach was the training grounds for air servicemen in 1940s. Many South Beach hotels were used as housing for the troops that would march and exercise on the beach, golf club, and streets on regular drills. The County Causeway was renamed the MacArthur Causeway in honor of General Douglas MacArthur. After the war, many of these veterans with “sands in their shoes” made Miami Beach their permanent home.